Iran's New President: U.S. Wants 'Excuse' To Confront Tehran : The Two-Way Hassan Rouhani, elected in June, has pledged greater openness on his country's nuclear program, but already he's seeming to echo the confrontational tone of his predecessor. Iran's new President Hassan Rowhani sits next to the national flag on his first official day in office in Tehran on Saturday. 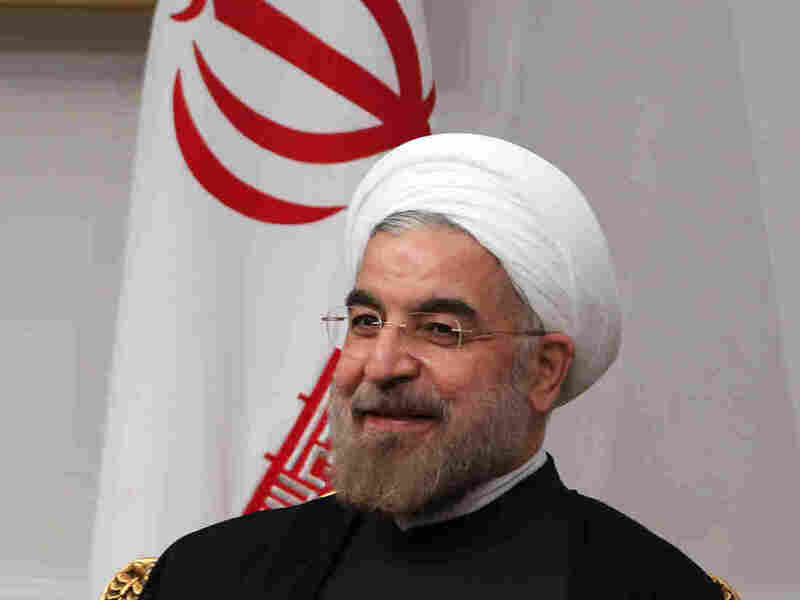 Hassan Rouhani, Iran's newly elected president, is being sworn-in on Sunday, succeeding the controversial Mahmoud Ahmadinejad, whose focus on the country's nuclear program proved a constant source of tension with the West. During a meeting with a high-level North Korean official late Saturday, Rouhani said Iran "[believes] the United States and the Westerners are seeking an excuse to confront the countries that they do not consider friends." In the talks with Kim Yong Nam, who was in Tehran for Rouhani's swearing in on Sunday, the new Iranian president referred to "the age-old, good and expanding ties between the two countries," Iran's Fars news agency reports. "Tehran and Pyongyang are in a common [anti-imperialist] stance," he was quoted as saying. "The U.S. and the West want to deprive independent states of their own inalienable [nuclear] rights, but independent countries will resist and defend their rights." Although president, Rouhani is beholden to the Supreme Leader Ayatollah Ali Khamenei, who has final say on policy issues. Rouhani, speaking to parliament after taking the oath of office, said he hoped confidence-building with foreign powers would help alleviate the nuclear dispute. "The only way for interaction with Iran is dialogue on an equal footing, confidence-building and mutual respect as well as reducing antagonism and aggression," he said. "If you want the right response, don't speak with Iran in the language of sanctions, speak in the language of respect." White House spokesman Jay Carney called Rouhani's inauguration "an opportunity for Iran to act quickly to resolve the international community's deep concerns over Iran's nuclear program. "Should this new government choose to engage substantively and seriously to meet its international obligations and find a peaceful solution to this issue, it will find a willing partner in the United States," he said.